Certain aspects of our lives can feel like a reoccurring anxiety dream. Always reaching for the end of rope that is always just a fingertip’s width away. But then again, we are relentless creatures – always moving forward, always running. We are always chasing the proverbial carrots at the end of the proverbial stick. The problem lies in the fact that some of us are chasing the wrong carrots on the wrong sticks. There are things in life that we are lead to believe are the things that we should be pursuing, and the truth is, they just aren’t. No matter what anyone thinks, energy is a finite resource. So, quit chasing the things in life that are eating up that precious energy, and start focusing on what it is that you TRULY need. I’m not in any way, shape, or form suggesting that you should quit dreaming, or pursuing dreams. 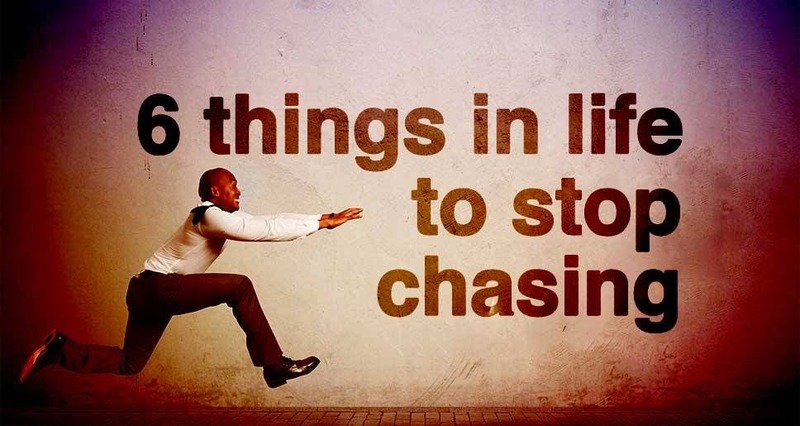 I am saying make sure that it is YOUR dream that you are chasing. We are bombarded every day by what people think it is that we should aspire to. Our perceptions of what we want versus what we need are lost in commercialism, other people’s perceptions, and our own blind ambitions. Take a second to step back from everything else and ask yourself, “what is it that I want?” Until you know the answer to that question, how can you possibly know which direction to run in? I’ve always said that “money can’t buy you happiness, even if it can take you more places looking for it”. It’s a cliche as old as money itself, but it’s as true today as it was the first time someone realized the wealth is not a condition of money. I personally judge my wealth by the people around me. Chasing money leads to working jobs that you hate, working hours that are killing you, and missing the days, months, and years of your life that you’ll never get back. If you’re so obsessed with a number on a paycheck that you are letting life coast by you in the background, what good is the money that you are making? This theory extends to the pursuit of material goods, as well. Sure, a little retail therapy can enhance your life temporarily, but constantly seeking material goods is an empty practice. The is no prize for dying with the most toys. There is however a prize for being fulfilled – it’s called happiness. Again, I turn to the social media phenomenon that has taken over modern social society for this one. Everywhere you look people are crying out for validation and attention. One perfect example I love to use is what I call “vaguebooking”. We all have that friend that will post something like “I just don’t know what to do anymore 🙁 ” and we are all expected to jump into their pity pool to rescue them. If you truly don’t know what to do in life, making a Facebook or twitter post isn’t going to do you any good. If you have a problem, talk about it. Express it. Keep in mind the boy that cried “wolf” – eventually people quit listening to him. No one understands you, except you. No one has to like you, except you. If you base your opinion of yourself on other people, how can you be expected to like yourself? Inevitably, for whatever reason, there are going to be people in this life that simply don’t like you. By giving them sway over your own opinion of yourself – you are essentially putting them in control of your happiness. Guess what, they are probably looking for validation in others too, so why jump right in the same miserable boat? Realize that you are who you are, excuse the Popeye reference, and love you for exactly who you are. You’ll never be happy with anyone else if you aren’t happy with yourself. Again, happiness is not something that can be obtained – it is a collective assimilation of several aspects of your life. Essentially happiness is a choice that you have to choose. You can scour the earth to find it, and if you don’t enjoy the journey for what it is, you’ll miss the whole point of the trip. That’s how life is: You can very easily miss the forest by searching for a specific, nonexistent tree. Believe me, if I could put “happy” in a bottle, I wouldn’t sell it – I’d give it away. Happiness is something that we all struggle with every single day. Walking through life looking back keeps you from seeing what is right in front of you. And then guess what? The only way to see it is once you are already past it. Life is in front of you, turn around and see it for what it is. Sure, reminisce – remember – relish – lean on past experience. But don’t blind yourself with what could have been to the point where you ignore what could be.